New Year's Day. National Holiday. Most businesses are closed today, but the festivities go on. On New Year's eve, many restaurants will offer a special meal, and the town will have a fireworks display after midnight. It's traditional to eat as many grapes as you can while the clock strikes the twelve last alarms of the night. This symbolized the good luck that this year will bring! Dia de los Santos Reyes or Reyes Magos. This is the day when Mexicans exchange Christmas presents in accordance with the arrival of the three gift bearing wisemen to Jesus Christ. According to them, the wise men took days to arrive in Bethlehem to give Jesus their gifts. This day ends the 'holiday season' officially. 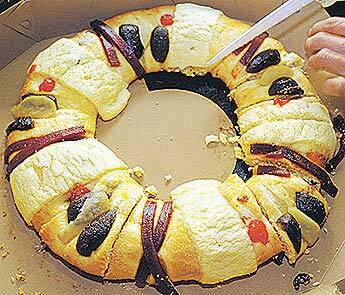 On this day, there is a special bread that is baked with small dolls inside. As each piece is cut, guest know that the ones who find the small trinkets in their piece are responsible for hosting a party on Feb. 2, 2010. Feast Day of San Antonio de Abad. Religious Holiday during which the Catholic Church allows animals to enter the church for blessing. Most churches celebrate animals instead these days. Dia de la Candelaria. Religious holiday that is celebrated with processions, dancing, bullfights in certain cities, and the blessing of the seeds and candles. Constitution Day. Official speeches and ceremonies are conducted nationwide on this holiday. Flag Day. Official holiday that commemorates Mexico's constitution. Cozumel is very proud of the large flag that we have waving our beachfront area. 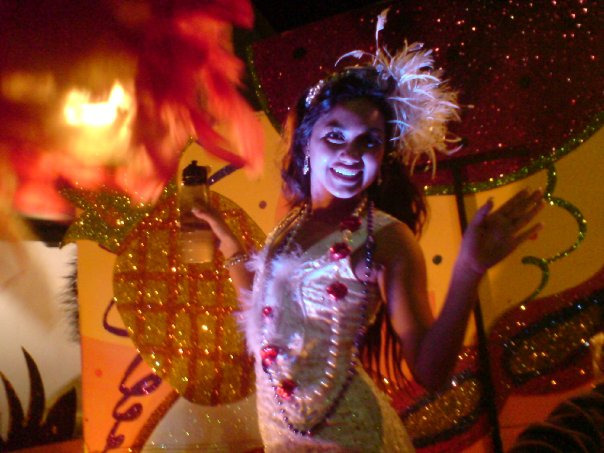 Carnaval is an official Mexican holiday that kicks off a five-day celebration of the libido before the Catholic lent. Beginning the weekend before Lent, Carnaval is celebrated exhubrantly with parades, floats and dancing in the streets.There are a lot of local events that begin before the public celebrations are seen. As soon as the Christmas festivities are over, the carnaval participants begin preparations. The dancers begin practicing their dances, the designers begin their creations. The biggest events are the parades which are Saturday, Sunday, and Tuesday, before Ash Wednesday. The parade begins at the south part of town behind the municiple building, goes down the beachfront 'Malicon' to the airport road, and then back. Most parades begin about 6:30 and end about 9:00. The last one is usually the longest and best as that is the float competition night. 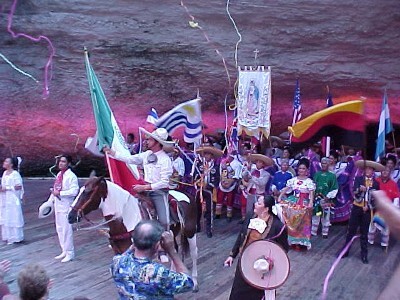 This is Cozumel's best celebration and takes many weeks of preparations. Valentine's Day is celebrated as "El Dia de la Amistad" which is Day of Friendship. The lovers celebrate this day as do neighbors, friends, teachers, parents, etc. It is totally proper to give flowers, chocolates and cards or take someone out for dinner that you are close to, even if not romantically. Flag Day. Official speeches and ceremonies are conducted nationwide on this holiday honoring the Mexican flag. .
Benito Juarez's Birthday. Mexico observes a national holiday to honor one of the country's most beloved presidents and leader of the 19th century Reform movement. Vernal Equinox. Visitors gather on the vernal and autumnal equinoxes at the main temple at Chichen Itza to witness the spectacular descent of the plumed serpent, Kukulcan. The ancient Maya constructed the pyramid-shaped temple on such a way that, during the equinox, a beam of sunlight creates a dramatic serpentine shadow that moves down the steps towards the earth, like a real snake slithering down the face of the temple. The twice-yearly occurrence is supposed to ensure a good harvest. Holy week and Easter. "Semana Santa"During the days leading up to and including Easter, Mexicans hold celebrations and somber processions in observance of Christ's resurrection. This is a holy week that ends the 40-day Lent period. This week includes Good Friday and Easter Sunday. It is Mexican custom to break confetti-filled eggs over the heads of friends and family. Día del Niño. Children's day. Parents and schools prepare many surprises and presents for their kids. They have parties, and go to events that Cozumel offers through out the town. If you make friends with families that have children, you will be rewarded with big smiles if you think to bring them a treat on this day. Primero de Mayo is the Mexican national holiday that is equivalent to the U.S. Labor Day. Most businesses are closed, restaurants have special dinners for diners, and the beaches of full of family fun. This historic festival is held in the small town of El Cedral, in the south of Cozumel Island at the end of April. This annual event is said to have been started over 150 years ago by Casimiro C�rdenas. C�rdenas was one of a group that fled to the island from the village of Saban, on the mainland, after an attack during the War of the Castes. The attackers killed many other villagers, but C�rdenas survived whilst clutching a small wooden cross. Legend has it that C�rdenas vowed to start an annual festival wherever he settled, to honor the religious power of this crucifix. Today, the original Holy Cross Festival forms part of the wider Festival of El Cedral, which includes fairs, traditional feasts, rodeos, bullfights, music and competitions. The celebrations last about 5 days in all and are held every year at the end of April or beginning of May La Feria de Cedral" is a popular event for the locals. It is a fair type event that includes an array of traditional Mexican/Yucatecan dishes and crafts. They exhibit live stock, as the US fairs do, and have rides set up as well. There are also bull fights, and they eat the bull afterwards. If you have never seen a bull fight, it is hard to watch. The fight is bloody and not suited for children. Holy Cross Day. 'Dia de la Santa Cruz", when constructiono workers decorate and mount crosses on unfinished buildings, followed by fireworkds and picnics at the construction site. Cinco de Mayo. This national holiday commemorates Mexico's 1862 defeat of the French in the Battle of Puebla. Many Americans celebrate it thinking it's equal to the United State's 4th of July celebration. It is not the major holiday in Mexico. Mother's Day. Due to the importance of the mother in Mexican culture, Mother's Day is an especially significant holiday. There are many programs at schools, and moms get flowers at restaurants and stores. This local event brings visitors from all over the world. The First Place winner goes home with a brand new car! . Navy Day is an official Mexican holiday. Annual State of the Union. Mexican president speaks to the nation. Date may vary slightly year to year. Independence Day. Mexico observes its 1821 independence from Spain with speech-making, flag-waving, fireworks, horse races, mariachi bands, and an abundance of decorations in red, green and white: Mexico's national colors. Autumnal Equinox. 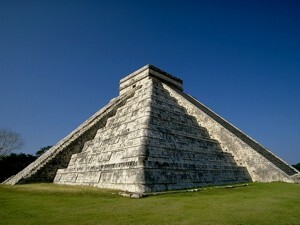 The shadow pattern of the plumed serpent Kukulcan descends the main pyramid of Chichen Itza, just as it does in the vernal equinox. Dia de San Miguel. The patron saint of the town of San Miguel is The Archangel San Miguel. Every year from Sept. 21-25,there are fireworks, and Naval processioin in the town square in front of the pier. About 90 years ago, a group of workers digging in an area north of town unearthed a statue of the archangel St Michael carved from ivory, brandishing a sword of pure gold and wearing a gold crown. This event occurred on a day holy to San Miguel � September 29. To the locals, this coincidence was too great to dismiss as less than a miracle, and thus the town was renamed. The statue is believed to have been a gift from Juan de Grijalva as part of an attempt to introduce Christianity to the island. The original statue was sent to Merida to be restored. Some say that the real statue never returned, and that the one on display is an exact replica rather than the original, but this has never been proven. Today, the locals wish for safety from hurricanes, a good tourist season, fruitful fishing season, and God's blessing. "Dia de la Raza" celebrates Columbus' arrival to the Americans, and the historic origins of the Mexican race. Day of the Dead, or All Souls' Day. "Dia de los Muertos". 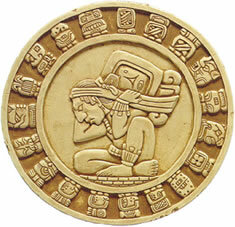 This Mexican holiday merges Pre-Columbian beliefs and modern Catholocism. Europe's All Saints' Day and the Aztec worship of the dead contribute to these two days that honor Mexico's dead. Deceased friends, relatives, and ancestors are remembered and honored in a traditional Mexican celebration that includes graveside picnics, skeleton-shaped candy and dolls, and a party-like atmosphere. It was traditionally believed that the spirits of the dead return to earth on this day. Anniversary of the Mexican revolution. Parades, speeches, and patriotic events recall the Mexican Revolution of 1910. Day of the Virgin of Guadalupe is celebrated with a feast honoring Mexico's patron saint. Las Posadas celebrates Joseph and Mary's search for shelter in Bethlehem with candlelight processions that end at various nativity scenes. These continue through Jan. 6. Christmas Week celebrations. Festivities include a two-day feast commemorating the Virgen de la Soledad, nightly "posadas" (re-enactments of Joseph and Mary's search for lodging), breaking of piñatas, and candle-light processions.